Okay, this one needs to carry a warning - this image may upset some viewers, so if you think that may be you, please don't look! It was drawn in brush and pen on paper in black and white, then the colours were painted out on a separate sheet of paper, the two images were scanned (at the same resolution) and combined on the computer. I like to keep black linework looking sharp! Originally, it was going to be in black and white only, but I thought adding some colour would make it even more striking (not less so, as is sometimes the case). Unfortunately his face became washed out with scanning, but I'm not sure it matters. I'm pretty happy with the way the composition came out: it's set up a bit like a horror image, but that's intentional. There were a lot more dogs at the pencil stage, but I removed them, because I thought they diluted it. The inspiration for this picture came about from a very stupid story I was reading in a weekend magazine from a local newspaper. Just as this particular "sport" has been outlawed in the U.K., apparently some locals thought it would be a good idea to get it going here. While I recognise the problem of introduced animals in Australia (only too well), this is not the solution - one can only think some people are after an excuse to carry out such activities! By the way, it's a crowbar our sporting hero is holding in his hand - sorry if that's ambiguous. Thinking back, maybe one reason I have such deep contempt for this "sport" is because I remember as a kid in Northumberland (when I was visiting England), seeing the badger holes all blocked up before a foxhunt, so the fox couldn't run down them! the Hardy boy allusion is a great comparison! i see the same. 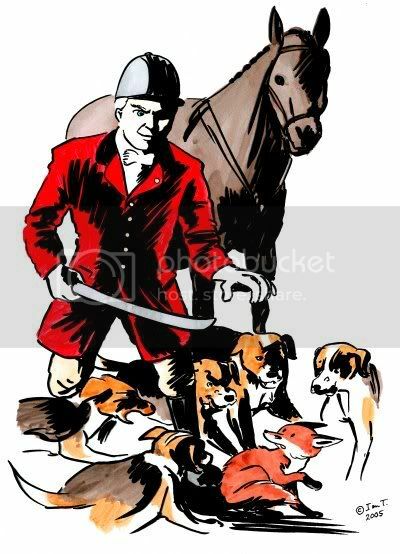 great illo, they outlawed the so-called sport in the UK for a reason, and i hope it happens on your home turf as well...some red-necks will use any excuse for bloodsport. interesting. i like the action and the expression/pose of the fox. so nice. Aw! Poor fox! The illo is really great though! the expressions of all subjects are great! thanks for the nice comment! oh this is really really really great! what a wonderfully executed illustration. by far my favorite this week. p.s. thanks for your comment on my illo - you're right, there is no real connection between ducks and baseball, just a weird idea i had. ADF, thanks, I think you're right about the style of illustration: the fox needs some kids to save him! Kerry, unfortunately they're not all rednecks here - we actually have people flying it to participate in this activity: that's commitment! Thanks all - I didn't exactly enjoy drawing this one, but I'm pleased with how it turned out. Awesome drawing with great impact! I love this illustration for its ferocity. This is a "sport" I absolutely despise, and this illo holds a mirror up to its ugliness, sending the perfect message. Thanks, Aravis! This one is pretty much the last to go - similar craven activities - "badger baiting," otter-hunting, etc. have all been banned. Apart from "hare coursing," which is still also happening a bit :(. i feel sowwy for the fox. I wish he'll let him go.